After a quick leak of the release date for Overwatch, Blizzard has officially announced the release date as May 24, 2016. You can see the press release here. I first had a chance to play Overwatch at Blizzcon 2014. For those that don't remember, Blizzard had been in development of a new, top secret game for years, only to tell us they had given up on the title in mid-2014 (if I recall correctly). I bought the line as much as most people did, and as they likely expected, I went crazy when they played the first Overwatch teaser at the Blizzcon opening ceremony. After, they had an area where you could play a fairly limitted version of the game, and it was easily the most fun I'd ever had playing an FPS. Surely some of that was just the hype, and being in that moment, but I really did feel like this was a genuinely good FPS. It turns out, I'm terrible at Overwatch. At blizzcon no one knew what they were doing, so I could kind of keep up. But now that there are a significant number of really skilled players on the OW beta, I kind of feel bad queuing up. I should probably invest some time looking at the maps so I can be a bit better prepared when the real game comes out. And perhaps find some friends who will help me get some experience without the pressure of performing well in a random group. With that said, don't take my advice on how to do anything in game, or even which characters to play. I still want to talk about a few of my early favorites, just don't assume that means they're actually good. 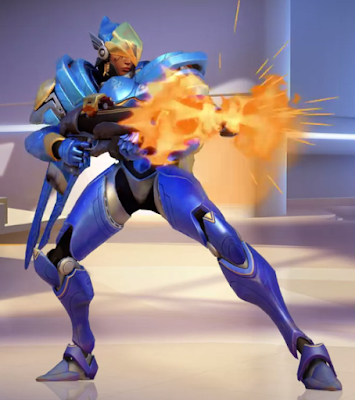 Pharah is the only offense character that I've really gotten excited about while playing. While her ultimate ability felt a bit underwhelming, I enjoyed not having a machine gun feel, and thus every shot being important. 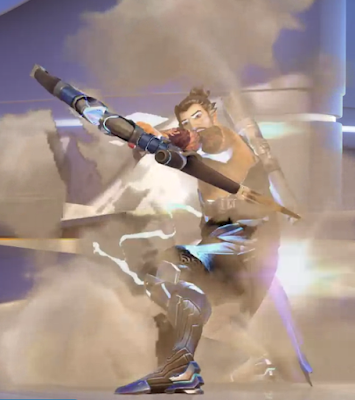 I also really liked trying to find creative uses for the jet pack: trying to sneak up on people, hover around corners and such, or shooting people from a direction they thought was safe, like when Widowmaker is in a sniper position, or occasionally you can catch Genji during his ultimate. Hanzo was the first character I randomly picked up when playing at blizzcon, and I imagine many non-dwarven hunters will have similar reaction to getting to use a bow. His ultimate ability has an awesome visual, maybe the best visual in the game, really. And both Scatter Arrow and Sonic Arrows give you a great edge when defending, making sure no one can sneak up on you. I found myself gravitating toward the defense role, which is a little bit odd, because in RBGs I hate having to play the typical hunter role of just sitting on a node, hoping someone attacks me. Of course in Overwatch, there are no stretches where you'd go an entire match without anyone attacking, everyone is pushing/attacking and defending, at various points. A scientist who's been studying in Antarctica, Mei is fairly awesome. 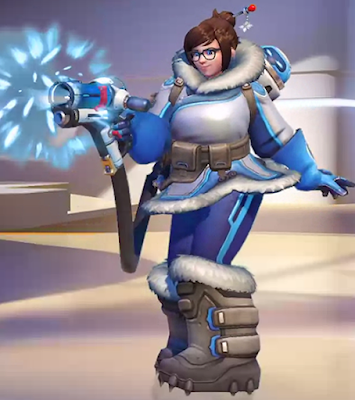 I didn't enjoy her main weapon as much as the others; not a big fan of the machine gun or constant stream of damage feel (at least, it feels kind of weak after playing Hanzo/Pharah),but having the CC effect added to it makes Mei super fun to play. When used strategically, and also employing Ice Wall, you've got plenty of time to kill off the most OP attackers. Ice wall only lasts for a few seconds, but it gives you opportunities to pull of some pretty clutch moves when you're under attack. While I've been enjoying playing in the closed beta, the open beta will be May 5th-9th, and should introduce tons more players to the limited current pool, plus an early release of the open beta starting the 3rd for anyone who pre-purchases the game. If you're planning on playing, and feel like teaching me how to dougie, let me know!